This was a stunning watch. It has a very large face and extremely easy to read. The blue was brilliant. It's still working like a charm and makes my boyfriend look extra handsome. 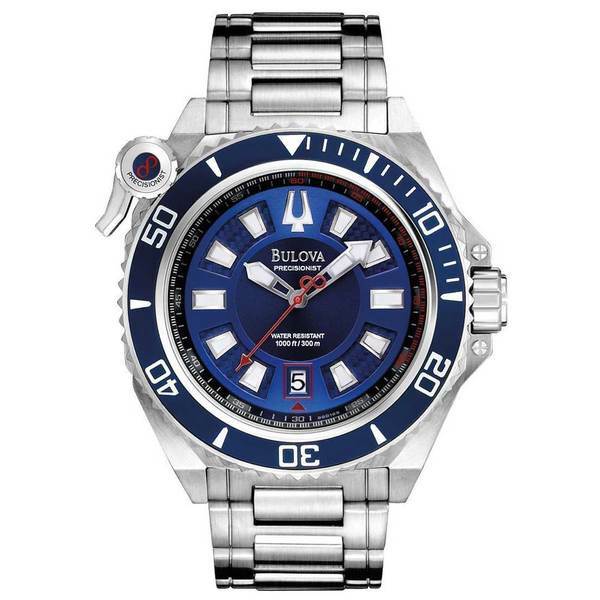 Bulova Precisionist Catamount Blue Dial Men's Watch 98B168 Stainless steel case and bracelet. Unidirectional blue ion-plated bezel with locking leaver. Blue dial with luminous hands and index hour markers. Minute markers around the outer rim. Dial Type: Analog. Luminescent hands and markers. Date display at the 6 o'clock position. Quartz movement. Scratch resistant mineral crystal. Screw down crown. Solid case back. Case diameter: 42 mm. Case thickness: 10 mm. Round case shape. Band width: 24 mm. Band length: 9.75 inches. Fold over clasp. Water resistant at 300 meters / 1000 feet. Functions: date, hour, minute, second. Casual watch style. While this is certainly a watch for a large man, it is very nice looking. My husband collects watches and this was a Christmas gift; many, many complements!